Today’s post is sponsored by Mondelez International. All opinions are my own. Can you believe it’s November already? This year is flying by! It is my favorite time of year for many reasons, one being all of the delicious food we are able to enjoy during this festive season with friends and family. If you’re hosting Thanksgiving dinner, or participating in a potluck style holiday, this Apple Cheddar Melts recipe is incredibly simple to create and delicious too! This bite size appetizer offers the perfect mix between sweet and savory with a crunch! It will tide your guests over until the main course as well. If you’re a fan of TRISCUIT crackers, read on to grab the recipe below. 2. Cut cheese slices diagonally in half. Mix cinnamon and sugar in medium bowl. Add apple slices and toss to coat. 3. Place crackers on baking sheet; top with cheese and apples. 4. Bake 4-5 minutes, or until cheese is melted. Serve warm. I paired this tasty appetizer with butternut squash dip from scratch. Let’s just say – the entire appetizer was gone fairly quickly. Do you have a favorite party appetizer that you like to serve friends and family this time of year? Be sure to check out even more delicious ideas at the Ultimate Party Planner website and snag great coupons for Nabisco products that you love, then pick up your ingredients at Publix. 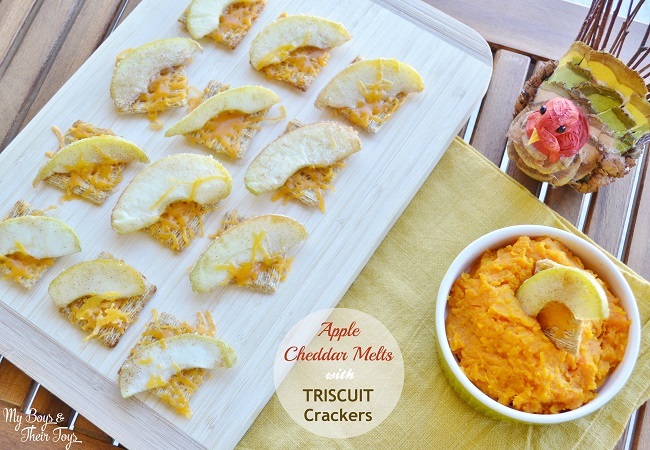 This Apple-Cheddar Melts recipe is blogger tested and approved! Look out for more holiday entertaining recipes coming your way soon! These look delicious, what a fab combo of flavours for a simple appetizer! Those look super yummy! I know my kids would love them too. Yum! I bet the kids would love to munch on this for Thanksgiving! I can not believe it is already November. Time is flying, but these look fantastic. This would be a fast easy appetizer for thanksgiving day. I could see this being a great snack for the kids! My nieces and nephews would love this while we’re all together during Thanksgiving week! 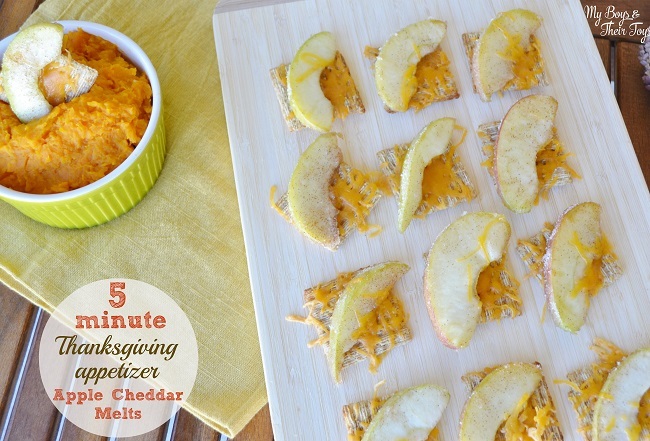 This sounds yummy-cheddar and apples together! I bet it would taste great with sliced pears too! True, I bet those would be a delicious substitute. How neat an idea thank you Nabisco for such great and varied products, I love the idea of the apples and cheese together and I also love the recipe for Ham ‘n Swiss Spicy Jamwiches on Nabisco site. This Recipe Looks Delicious! I Love TRISCUIT Crackers, This Is A Fun Recipe! This looks very unique and delicious! I’ll definitely be making this soon! I bet that is delicious with the butternut squash dip! I love anything with apples. 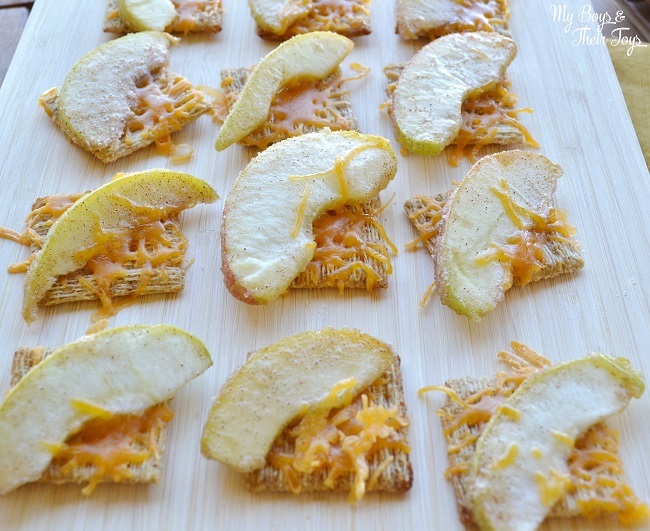 These look tasty, I love cheese and apples together. My friend is obsessed with triscuits! I can’t wait to share this recipe with her! Time is flying! I love savory and sweet together and this looks like a yummy and convenient recipe! Thanks! I am visiting from the Frugal Friday Link Up Party. This looks delish! I am going to make this before thanksgiving. 😉 thanks for sharing! Those Apple Cheddar Melts look delicious! This would be a great app for adults and kids alike… I’ll have to try them! These look really good!!! My kids would even eat these, especially my daughter!! This looks good! I never would have thought of this type of combination. I bet it tastes yummy. Thanks for sharing. These look delicious! The combination of cheddar cheese, and apples sounds great! This is a unique and fun way to make an appetizer and I want to make it for Thanksgiving this year! Thanks for the idea!